Maybe it was because I'd run a 5k race that morning (in 26 minutes, she slips in incidentally) and had aching muscles and was finally out of adrenaline. Or maybe it was the fact that I'd been drinking wine all afternoon in the blazing sun (or as close to blazing sun as we get up here anyway), my arms were sunburnt and a hangover was starting to kick in. But whatever the reason, somehow, unlike the Greeks, I just couldn't get into Troy. Or maybe it was because, after all the hype, Wolfgang Peterson's sword and sandal epic just isn't all that good. For starters, there's the terrible wooden dialogue. As so often happens in blockbuster movies, and I so often moan about, the GDP of a small but prosperous country is spent on special effects, whilst some primary school child of no great intellect is paid 50p to write the script on a Friday night in between Neighbours and Top of the Pops. 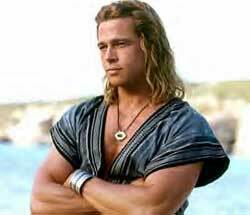 Then there's the terrible wooden acting, of which Brad Pitt, as pouty blond hero Achilles, is the worst culprit (more of him later). 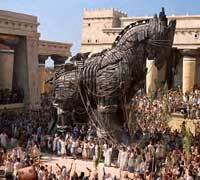 In fact, the only wooden thing that isn't terrible is the Trojan horse, which is actually pretty cool. Although no attempt is made to explain why the Trojans are so cretinously stupid as to bring the damn thing into their city without first checking to see whether it has, er, an army of soldiers inside it. Like, duh! Apparently, in the book (that'll be Homer's Iliad), some clever dude cunningly convinces them that it's a gift from the gods. Or something. You see, I haven't actually read The Iliad, which I was hoping would be an advantage, sparing me the 'that's not supposed to happen' outrage currently affecting classical buffs the length and breadth of the nation (probably). Apart from having a vague inkling that Helen was supposed to be the most beautiful woman in the world, Achilles was supposed to be gay and the Trojan horse wasn't supposed to be fighting it out with the other characters as to who could be the most wooden, Troy was pretty much a blank canvas to me. So is Helen, 'the face that launched a thousand ships', the most beautiful woman in the world? Well, Diane Kruger is certainly very lovely, and it's easy to see how, with her poised, classical beauty, she could capture the heart of Orlando Bloom's oiled stick, Paris. 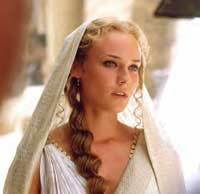 However, in the political world of Troy, Helen's beauty is beside the point. In this version of the story, she is merely a pawn, the excuse that allows Brian Cox's superbly ebullient Agamemnon to attack a city he's had his eye on for years. Cue a sea that's dark with, yes, a thousand CGI ships, unleashing a horde of spear-toting CGI warriors onto the beaches of Troy. 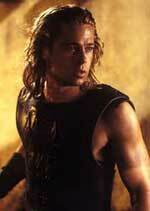 Which brings us to 'the greatest warrior of the Greeks', Achilles. Who's NOT gay. Did I say that loudly enough? NOT GAY! Patroclus is his cousin and he sleeps with girls. GIRLS, d'you hear me? WOMEN! Got that? Good. Anyway. To be honest, I was expecting more of Brad Pitt. If he'd brought even a fraction of the adrenaline-fuelled danger and excitement he invested in his performance in Fight Club I'd have been enraptured. Instead, Brad's Achilles may have the body of a god, but he has the puffy face of an alcoholic who's seen his way to the bottom of one too many bottles of Jack and the sulky expression of an Avril Lavigne fan asking why life has to be so complicated. Stomping around his tent in a Beckham-style sarong or leaping in the air in his natty leather miniskirt and rubber armour that literally bounces, he ain't fooling nobody - certainly not Peter O'Toole, anyway. The scene in which O'Toole's Priam comes disguised to Achilles' tent to beg for the return of his son Hector's body is a timely lesson in acting from the old pro to the young pup. At least Brad has the courtesy to look shamefaced as the veteran screen god effortlessly puts on the performance of a lifetime, enunciating each tired line as if it were Shakespeare. Indeed, this is the only part of the film when you will be moved, you will be engrossed and you will believe that this might actually have happened. Shame about the other 155 minutes, really. On the whole, the rule of thumb is that the older the actor, the better the performance. So Peter O'Toole and Brian Cox are splendid and Brad Pitt, Orlando Bloom and Diane Kruger are pretty crap, although Hulk star Eric Bana makes a fair stab at playing Hector. Somewhere in between you have Sean Bean, who makes a fairly convincing Yorkshire Odysseus, although, like everybody in the film, he's been told to 'talk like they do in the RSC'. Which is probably why everybody ends up sounding like Cary Grant. And as we all know, nobody talks like that. Fair enough, these aren't ordinary people we're talking here, these are heroes, demi-gods: Achilles, Ajax (looks like a character out of Street Fighter 2 but never mind), Hector, Paris, Odysseus... Legends to a man. And lest we forget that the story of Troy is epic history in the making, the crappy script is there to remind us every ten minutes. 'Our names will echo across the centuries,' 'This will be the greatest war in history,' 'They will be telling stories about this war for thousands of years' we are told ad infinitum. Yes, we think, fifteen minutes in to the film, I think we've got that now. And you can't help wondering whether this is supposed to be a reflection on the film's place in the history of film, joining a line of unforgettable movies stretching from Cecil B DeMille's desert epics through Spartacus and Lawrence of Arabia to Lord of the Rings. Well, it might be supposed to, but it's bloody well not. And anyway, just because characters are epic heroes, it doesn't mean we can't care about them. 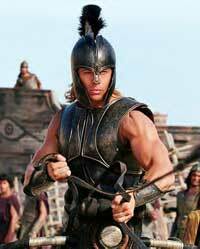 If we can be moved to tears by Spartacus, Aragorn and Frodo, or even Russell Crowe's Maximus, why can't we care about Achilles and Hector? Which I think brings us back to the film's Achilles' heel(s): the wooden dialogue and acting, which somehow never convinces. Even the score isn't up to much, the brazen trumpet fanfare that accompanies all the battle scenes, the Lawrence of Arabia rip-off love theme and the God awful Dead Can Dance style Eastern wailing that strikes up every time someone dies (and a lot of people die in Troy) are so over-used you're sick to death of them by the end, when some dreadful song takes over instead, the lyrics of which of course pose the inevitable question 'will they remember our names?' No, because we're all legging it out the cinema as fast as we can. Much has been made of the fact that the gods are missing from Troy, and fair enough, the whole thing would have been much more fun if the strings of the characters had been jerked at will by, say, Brian Blessed as Zeus, Judi Dench as Pallas Athene and, ooh, Cher as Aphrodite. But to me that wasn't the only thing that was missing from this film. Try, a decent script, some characters we could care about and, well, just a smidgeon of excitement. On a second viewing, I think perhaps I've been unkind in this review, but with all the money that was thrown at this film and all the hype that accompanied it, it's a pity that the result, like the Trojan horse, is wooden, every so slightly ludicrous and utterly hollow.